There are several aspects to treating periodontal disease. For example, the only way to stop the disease’s progression and allow your gums to heal is to remove the harmful oral bacteria that have accumulated underneath your gum tissues. This process, known as scaling and root planing (or periodontal cleaning) may be the full extent of your treatment, or it may just be the first step, depending on the severity of your gum disease. For many patients at our Encinitas/San Diego periodontal office, the use of platelet-rich plasma and fibrin helps optimize periodontal treatment and maintenance in several ways. The platelets that flow through your red blood cells are a significant part of your body’s overall healing factor. For example, if you have a wound, your platelets help promote clotting around the wound to stem bleeding and allow it to heal. Platelet-rich plasma is a concentrated solution comprised of your body’s own platelets, and can be used as a way to bolster your periodontal tissues’ ability to heal when they need it most. For example, following deep periodontal cleaning or laser gum treatment, the use of platelet-rich plasma can speed up healing, reduce the risks of infection, and improve the results of your treatment. When your blood platelets initiate clotting, a protein in your blood plasma known as fibrinogen produces a matrix called fibrin. This matrix helps impede blood flow to further promote successful healing, and as part of your periodontal treatment, it can also be harnessed and utilized as part of your platelet-rich therapy. Together, platelet-rich plasma and fibrin can help you enjoy improved periodontal health long after completing your periodontal procedure. Aside from deep cleaning and laser periodontal treatment, platelet-rich therapy is also beneficial in many other periodontal and dental implant procedures. If you require a gum graft or plan on replacing one or more teeth with dental implants, then platelet-rich treatment may be an important part of your follow-up care and maintenance therapy. Enhanced healing and oral bacteria control make it preferable for a wide variety of treatment options. 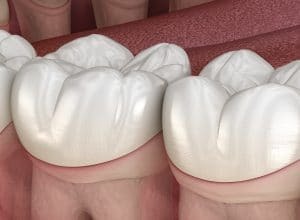 Platelet-rich plasma and fibrin therapy offer a holistic, highly biocompatible way to boost your gums’ ability to heal following periodontal treatment. For more information, schedule a consultation with Dr. Kania by calling her periodontal office in Encinitas/San Diego, CA, at (760) 642-0711.